I've Reached Hawaii... and very nice it is too! Aloha ! We've reached Honolulu... and it's wonderful ... more on that later. Last update we were in San Diego - a nice place to spend the Winter. 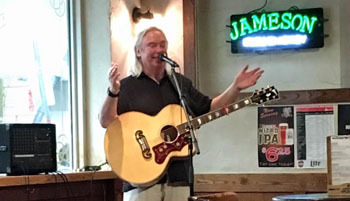 While I was there I wrote songs, played gigs in The Field Irish pub in the Gaslamp area, met some good friends and enjoyed the weather. Great! The Field is a good Irish pub with great beers and food. I played three sets each time and went down really well (I got another 2 gigs after playing my 1st one). We were pleasantly surprised to see Anne & Marty who came along to my 1st ever gigs in Lake Oswego (in wee Mahers) years ago, they now live in San Diego. They came to two of my shows and took us on a trip to see the San Diego sights (and eat apple pie in Julian (an old gold mining town - now famous for it's apple pie mines)). The last night in the Field (Wednesday) was an absolute blast. The Riverdance were performing along the road which brought people in for an extra doze of Irish. There were a lot of people in there who were attending conferences (spot the lanyards & name tags!). Our new group of friends from the Chula Vista RV resort came along (we are now officially "The Rolling Cabritos"... named after the Tequila we were guzzling!) 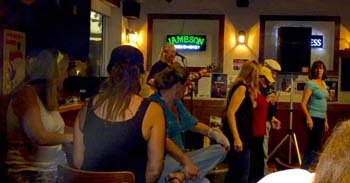 ... and there was a bunch of enthusuiastic locals - who love their Irish music (and tolerate my Scottish songs :)). All of that mixed together made a grand night! 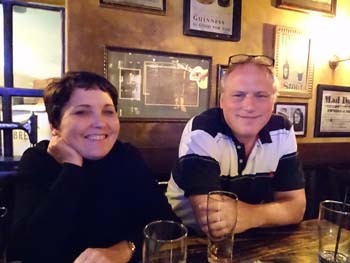 It wa also great to spend a day with Karin and Brian Six, we've known Karin since 1987 - San Diego life is pretty nice. The song writing went well in San Diego, however writing songs in an RV is not the easiest - so Dorothy has had to listen to a lot of rubbish as well as some good ones. And now we're in Honolulu. It's beautiful. The city is huge (over 1 million tanned people) plus tourists (in various stages of sun tan (ie bright red to dark walnut). 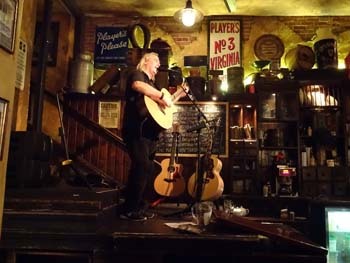 I've played two gigs in Kelley O'Neils in Waikiki, the 1st was the day after we arrived and the second was last night (Friday). Tuesday had less people, but they were engaged right from the start. It was Australia day and a bunch of high-spirited Aussies were happily shouting abuse, singing, cheering and drinking. I got my 1st 20 Australian dollar tip - I intend to spend it there one day. 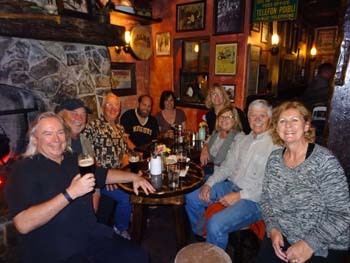 Friday night was fun, Nancy Smiley of the Hawaii Celtic group had posted a few times on facebook and there was a great turnout from the group. I got to experience my 1st Waikiki Friday night - it's one big party - Nice! 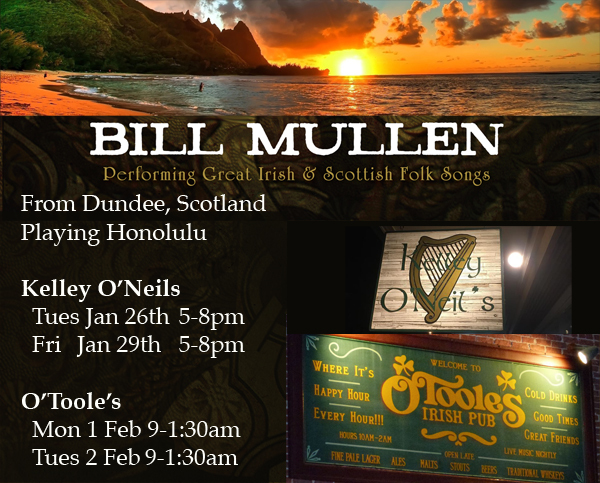 While in Honolulu, I will next play two gigs at O'Tooles (Mon & Tues 9pm-1:30). On Wednesday Feb 3rd I will run a blind whisky tasting for O'Tooles, my last one was in San Antonio Texas - looking forward to it - these are always a laugh. 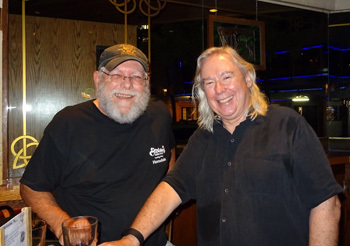 In the pic opposite I'm with Bill Comerford the owner of the Honolulu Irish pubs I'm playing in. We will attend (as in drinking, not playing) the Caledonian Society's Burns night this Saturday (Jan 30th). I wonder if the haggis will taste like pineapple and coconut? I had a nice call this week from Marilyn from the Portland Highland Games organisers, booking me for the games on July 16th. It'll be great to play there again - I was there two years ago. Last year I was still on the road and couldn't play - so it'll be nice to be back! We're working on another trip to Scotland for April, tentative plans are for April 11 to 29th, details still to be worked out. In May we'll be flying to Las Vegas to attend, play and celebrate at Mark Maher and Heidi Warren's wedding party - I know that will be a hooley to remember! Bill Comerford and sweaty Bill - before whiskey! After Hawaii we'll fly back to San Diego, pick up our house on wheels and head East - playing in the Highlander (San Antonio,TX), the Irish House (New Orleans,LA) and ending up at Nolans Irish Pub, Cocoa Beach Florida where I'll play three days for St Patricks celebrations (Thurs March 17, Fri 18, Sat 19). Meanwhile - we're enjoying Honolulu - there's a lot to enjoy!